With the flat season getting into gear, thoughts turn to the Classics and several of Excelebration’s first crop 3YO’s have Classic aims. 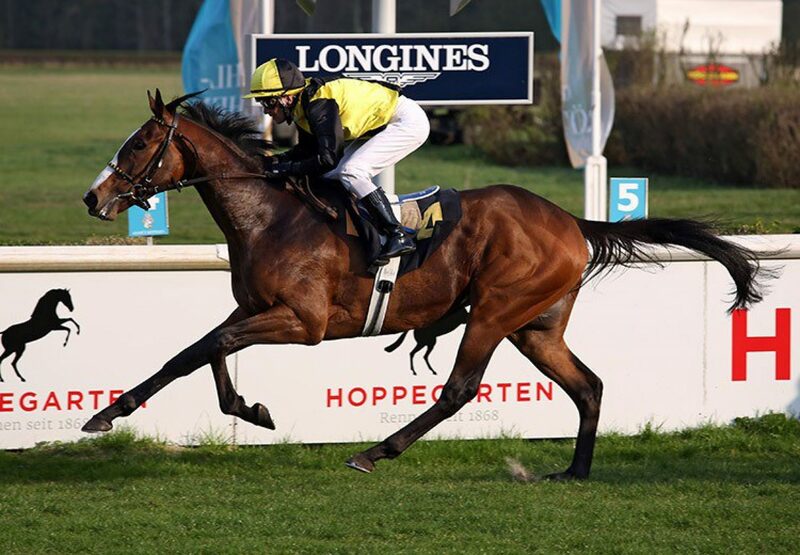 Kauttio (3c Excelebration ex Pinacotheque, by In The Wings) trained by Andreas Wohler, is joint favourite for the German 2,000 Guineas after an easy win in the Robert Koch-Forum-Preis (pictured) yesterday. Barney Roy (3c Excelebration-Alina, by Galileo) has been one of the “talking horses” for the 2,000 Guineas ever since he bolted up in a hot Haydock maiden last September for the Richard Hannon team. Recent reports from the yard have been very bullish and Richard Hannon confirmed on Friday the colt will start off the in the G3 Greenham Stakes en route to Newmarket. Ed Walker’s Ultimate Avenue (3c Excelebration-Dance Avenue, Sadler´s Wells) has the French 2,000 Guineas on his radar with a possible prep in the G3 Greenham. On the Ed Walker Sporting Life stable tour last week, the trainer commented “He is our exciting three-year-old colt this year. He is a big horse by Excelebration and did well to achieve what he did at two. He has done well and has strengthened up from two to three and is in good order.” Trainer David Simcock is also dreaming of Classic success with his unbeaten colt Brittanic (3c Excelebration-Fountain Of Peace, by Kris S) who has created a big impression in back-to-back wins at Newcastle. Simcock commented on the Attheraces stable tour "We’re very excited about Brittanic, who is unbeaten in two starts… He hasn’t come off the bridle yet and couldn’t have won any easier over the straight mile on his latest start in January. He will be trained for a Classic trial in the spring, though which one I’m not yet sure." Other notable Classic entries include the Group-placed Fulminato and a pair of unraced colts owned and bred by H.H. Aga Khan. Triple Gr.1 winning miler Excelebration was rated 133 at 3 years and 133 at 4 years by Timeform and stands for €10,000 this year.